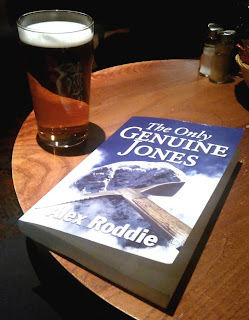 The Only Genuine Jones went live on the Kindle store one year ago today – at first just for a few early readers, then general availability on the 21st of October. Initial demand was high and the book quickly rose to no.1 bestseller in the Mountaineering genre, a position it has flirted with on several occasions since. In this post I would like to summarise my first year as a published author. I was prepared before I jumped into the deep end of independent publishing. I had done my research, produced a professional (and well edited) product, and got a cover designed by an artist. I had realistic expectations of what I would be able to achieve, and realistic goals. However, I was soon to discover that the learning curve was a little steeper than I had expected! Selling and marketing a book is a full time job, one where the goalposts are moving constantly. The modern indie author must be agile and able to react instantly to changing conditions – sometimes several times a week. I have experimented with different forms of promotion, from cut price sales to radio interviews, newspaper articles to online banner ads. The social media wisdom I’ve learned from establishing and working for Glencoe Mountaineer has been refined and reapplied to my new craft. I have learned an enormous amount in my first year. Possibly the most important lesson I’ve learned is that this is a long game in which extraordinary patience, resilience, and long-term strategies are rewarded. There are no quick fixes or short-term rewards. Success is not guaranteed and can only be the result of sustained effort over a period of years. I get asked this quite a lot, and it’s a difficult question to answer! On one hand, I don’t make a living from my writing, and most of the proceeds get invested back into my work. On the other hand the book has attracted surprisingly widespread critical acclaim and has sold better than I expected. My first statement from FeedARead (the printing firm in charge of the paperback edition) came through yesterday, and after adding up all the figures I am happy confirm that the book has sold in excess of 950 copies in its first year (Kindle and paperback combined). This is obviously small fry compared to some books, but considering that the average self published Kindle title sells less than two hundred copies in its entire lifetime, I’m extremely pleased with the readership foundation I have built up. On Amazon, the book has been reviewed 34 times, and 27 of those reviews are five stars. I have received only a single one star review to date, and to be honest I’m surprised I haven’t received more than that; I’ve always been aware the book has the potential to polarise readers. This is only the beginning. The purpose of The Only Genuine Jones and Crowley’s Rival was to test the waters, to gauge the appetite for historical mountaineering fiction. Given the enthusiastic response to my first two titles I am planning a more ambitious campaign in the years to come. I plan to release The Atholl Expedition within the next two to three months. This book establishes a new timeframe (the late 1840s) and will be the first in a new and ambitious series of books looking at the mountaineering culture of this earlier period. Watch this space for further details!